Sattari, M. (2016). On $n$-derivations. Sahand Communications in Mathematical Analysis, 03(2), 107-115. Mohammad Hossein Sattari. "On $n$-derivations". 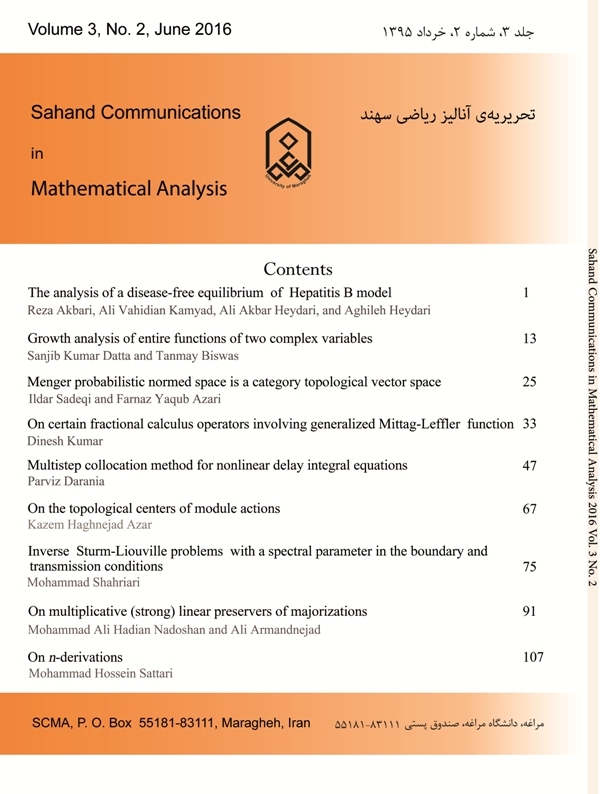 Sahand Communications in Mathematical Analysis, 03, 2, 2016, 107-115. Sattari, M. (2016). 'On $n$-derivations', Sahand Communications in Mathematical Analysis, 03(2), pp. 107-115. Sattari, M. On $n$-derivations. Sahand Communications in Mathematical Analysis, 2016; 03(2): 107-115. Department of Mathematics, Faculty of Science, Azarbaijan Shahid Madani University, P.O.Box 53751-71379, Tabriz, Iran. In this article, the notion of $n-$derivation is introduced for all integers $n\geq 2$. Although all derivations are $n-$derivations, in general these notions are not equivalent. Some properties of ordinary derivations are investigated for $n-$derivations. Also, we show that under certain mild condition $n-$derivations are derivations. F. F. Bonsall and J. Duncan, Complete normed algebras, Springpr-Verlag, New York, 1973. G. Dales, Banach Algebra and Automatic Continuity, London Mathematical Society Monographs, Volume 24, Clarendon Press, Oxford, 2000. H. G. Dales, F. Ghahramani, and N. Gronbaek, Derivations into iterated duals of Banach algebras, Studia Math., 128 (1998), 19-54. N. Dunford and J. T. Schwartz, Linear operators, Part I, New York, Interscience, 1958. F. Ghahramani, Homomorphisms and derivations on weighted convolution algebras, J. London Math. Soc., 21 (1980), 149-161. M. Hejazian, M. Mirzavaziri, and M. S. Moslehian, n-Homomorphism, Bull. Iranian Math. Soc., 31(1) (2005), 13-23. B. E. Johnson, Local derivations on C* algebras are derivations, Trans. Amer. Math. Soc., 353 (2000), 313-325. I. Kaplansky, Derivations of Banach algebras, In Seminars on analytic functions, Vol. 2, Princeton Univ. Press, Princeton, 1958. E. Samei, Approximately local derivations, J. London Math. Soc., 71(2) (2005), 759-778. A. M. Sinclair, Continuous derivations on Banach algebras , Proc. Amer. Math. Soc., 20 (1969), 166-170. I. M. Singer and J. Wermer, Derivations on commutative normed algebras, Math. Ann., 129 (1955) 260-264. S. Watanabe, A Banach algebra which is an ideal in the second dual space, Sci. Rep. Niigata Univ. Ser., A 11 (1974), 95-101.